Having started my climbing “career” in Washington probably around 15 years ago, I’d read and heard a lot about one Fred Beckey. Articles in outdoor magazines and the Cascade Alpine Guide series were my only real view into who this guy was and what he’d done, but after some time I discovered a more of his work (Challenge of the North Cascades) and really started to recognise what a unique character he is. 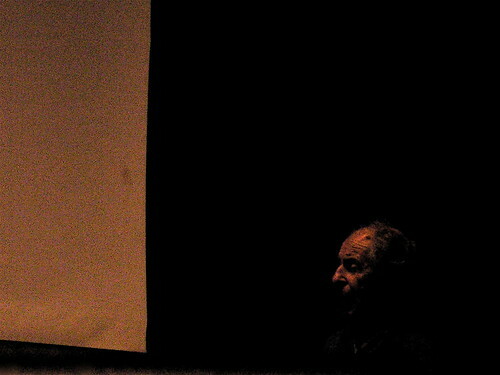 Last night Mr. Beckey gave a nice little slideshow here in Portland that I was lucky enough to attend. He spoke for almost two hours about the mountain ranges in North America and just how lucky he was to be able to get up them with various partners and in various conditions. He’s actually a great photographer and has a good eye. The photos of his slides I snuck don’t really communicate that very well (I wasn’t looking at my settings) but you get the idea. After the slideshow he offered to sign books and chat for a bit, so I went down with my older CAG (the brown one) and had him drop his signature on it. I asked him about his China trip next year and he lit up and said they’ve got a financieer now and if I can talk Nike into getting them some shoes I can come along. I smiled and told him, “Well, I work with Converse, so I’ll see what I can do!”. The folks in line behind me chuckled and I thanked him for his time and shook his hand and that was that. I had run into Fred a few times before back in North Bend. A few years ago I saw him sitting at Denny’s on our way out, and I walked up to him with Ian in my arms to say hello. He was sitting there with his little notebook reading and eating an omelette or something and didn’t even budge. I didn’t want to make a big scene or anything, so I just smiled and said “Nice to see you…” and kept on going. I really couldn’t belive I’d been snubbed by someone who I’d always considered a bit of a hero or something, so I was practically laughing outloud as we walked out the door. Amy was totally confused so I quickly explained who he was. Right in front of the restaurant was his red subaru parked almost diagonally across the two handicapped spots, with a ton of gear and stuff in the back. I just laughed again and smiled all the way home. You have to realize, I had pictures of this old man up on my wall in college, and Fred Beckey was my pen name in my freshman english creative writing class. The fact that his backyard was my backyard was just fun – and made for a lot of good reading and armchair mountaineering, as well as actually following in his footsteps. All in all, it was a fun evening and a pretty cool chance to meet someone I’ve admired for a long time. For a guy in his 80’s he’s still hustling and that’s pretty inspiring.